Nearing the eighty percent mark toward completion of their long journey, Helen’s confidence that they would make it to Santiago had been growing with almost every step. Of course, any number of calamities could still keep them from getting there, but she felt less vulnerable to the random events that might trip them up. If something happened to thwart them, she was certain its cause would be some external factor, rather than lack of resolve on their part. Despite this optimism about their journey, the morning found her morose. The trail had begun as a gentle ascent along the roadside path on the far side of town. Now they had turned into the woods. The humidity that was hanging thick had become misty fog. The path was narrow and had grown steadily steeper as they got closer to O’Cebreiro. So much for the feeling of accomplishment! Also, ever since the steep walk down from the Cruz de Ferro, when she hadn’t been able to get out of her own head, dark thoughts had been bubbling up from her subconscious. And, Bert had seemed distant since the Cruz de Ferro, but she supposed that she had been uncommunicative too, given how weighed down with her thoughts she had been. Try as she might, she couldn’t make them disappear completely. Yesterday’s fun afternoon of creating the fantasy about Portia and Edith’s friendship had helped, but today the funk was back. Perhaps it was the fog enshrouding the narrow path. If there were scenery out there that might lift the spirits, it was invisible. Not quite rain, they walked through almost-drizzle, and were forced to wear their waterproof jackets. Beads of moisture formed on their eyelashes, and from time to time they needed to brush droplets from their noses. What about you, Bert? The thought came to her instantly, but she didn’t say anything. Instead, noticing his uncharacteristic expression of concern, she responded without challenging him. It did seem to be a mood thing because Helen felt an alarming sense of unease—as if she were being whipsawed emotionally. She would settle her mind on less troubling things, and then without warning the unsettling ones would well up again. She couldn’t quite imagine that it would bring relief, but she found herself wanting to talk to Bert about it. She really wasn’t looking for his help, as much as for him to be willing to listen and understand. She knew she couldn’t explain it to him, but if they talked around the edges of the problem, he might fortuitously hit on a mood-changer. There had been a time when she thought that, with the right person, she could talk openly and honestly about the real her. It was a silly idea. She had tried putting her trust in Greg, and it had been a mistake. Since Greg, she’d never trusted anyone to get that close again. Once she had stepped to the brink with Bert, then panicked and backed off far and fast. Why should she expect him to be any different, she’d thought at the time. But here on the Camino she felt safer than any place she had been, maybe ever. And, for heaven’s sake, she thought, I sure as heck ought to have better judgment at this age about who I can trust than I did back then. They trudged along, watching their feet so as to avoid stumbling over rocks and roots as they climbed the shrouded, slippery path. There was unlikely to be a better time to reach out, she realized. They were already in a down mood, so it wasn’t as if she would be ruining anything. “Okay, I’m intrigued. Pray tell, what unhealthful things have been rattling around in your cranium.” He looked over at her, smiling slightly as he huffed and puffed up the hill. His smile evaporated, and he looked away. She could tell that he heard her and understood that she wasn’t about to share any secrets with him. On second thought, she feared that her statement had been overly dismissive and off-putting. “I don’t know, Bert, and it really bothers me. I don’t think there is a connection. As you well know, I was fond of the father who raised me, but I never met the one who left when I was a baby, so there can’t be much of a connection between the two of them. Except . . .maybe, deep down in my kid thinking . . .I feared my parents, especially my dad, would leave me too if I gave them any hint of a reason." "Wait, Helen, stop a minute," Bert said reaching over and putting his hand on her arm. "That's a dreadful thing for a kid to have to deal with. It sure is harder to be a child than it seems it ought to be,” he said unusually gently. They’d gotten beyond that next bend. O’Cebreiro wasn’t there yet, but the misty rain stopped and the trail widened. It was open on the right to green pasture land. The dirt was firm underfoot here where the moisture was not held in by trees on both sides. The potato-size stones that had littered the path disappeared and the overcast was lifting. They talked as they walked side by side, occasionally stopping to catch their breath and enjoy the views. “The trail sure is nicer up here. Look, up ahead. Those farmers seem to have just released that colt into the pasture,” noted Bert. They were next to each other on the trail. He reached over, letting his stick hang on his wrist, and took her gently by the arm. They stopped. Helen had to laugh. That was classic Bert. All cerebral. And back to normal from his gingerly emotional reactions. She liked his classic cerebral self, but she could come to really like his occasional reaching out to her from the heart. The Camino ended the conversation. The sun broke through, or maybe it was that their climb had lifted them above the clouds. Whatever the cause, the landscape was now a panorama bathed in patches of gold and silvery glow. “Look, there’s an eagle. I don’t know what kind, but I’m pretty sure it’s an eagle. They shared a laugh, and continued up the trail. Maybe it was the sun’s warm glow. Maybe it was the sharing and unburdening. Regardless, Helen felt better. The mood had passed. That was good. She was pleased and hoped it would last, but was also a bit uncomfortable. She hoped Bert wouldn’t read too much into what she had said. The woods closed in on both sides of the trail again as they climbed another steep ascent. And then, abruptly, they were at the top and there they were, in O’Cebreiro. Bert felt exhausted as he always did when they arrived at their day’s destination. In fact, today’s climb had been so demanding that for the past half hour or so he thought he couldn’t get more tired. But when they stepped out of the woods onto the paved road and saw the town smack in front of them, an additional heavy layer of exhaustion poured in like a tidal wave. Lately new little aches, pains, and weaknesses had made themselves known. The left knee, which had given out once and threatened to do it again, was perhaps a bit more on the brink than in days past. One toe tended to get numb after a few hours of walking, and he could restore it partly only after vigorous wiggling of all his toes. Also, a pain in his right hip visited him not when walking, but afterwards, when resting. It made sitting uncomfortable, and occasionally almost unbearable. And, of course, the twisted ankle could not be ignored. By this point in their adventure, it seemed clear to him that walking twelve miles in a day was something qualitatively different from walking twelve miles several days in a row. And walking twelve miles a day for several weeks was something else again. This was a funny day. The surprising wave of additional tiredness at the end fit the rest of it. They started on the steep and challenging trail in weather as gloomy as Helen’s mood. They ended the walk in bright sunshine in this lovely little village on top of the mountain. Looking back at the path from which they’d just emerged, they saw that the patch of woods embracing it was narrow. Just to their left, along the shoulder of the road was a wide stone wall topped with flat field stones. They sat, gazing and enjoying the respite. The views, back down to the valley where they began and across it to cloud-topped mountains, were spectacular. Bert thought about how the early fog and drizzle, the heavy air, and the grueling initial ascent with no clear vistas to reward them, had led him to pondering his aches and pains. Ever since La Cruz de Ferro, it weighed heavily on him that maybe Helen couldn’t be a part of the new life he had to make for himself. He had been shaken out of his mood by Helen’s reserved but uncharacteristically candid sharing of her thoughts and talk about cemeteries. What a strange conversation! It was so clear that she had been really upset thinking about her dad and her father, as she called them. He hoped he hadn’t said anything he shouldn’t have. The universe must have created this day for borderline craziness. Somewhere in it was the germ of a hope that Helen might be willing to look to a new future also. Here on top of the mountain, the air around them felt different. What had changed? Was it the day, the Camino, Helen’s revelations? Had the nature of their friendship shifted? What made their closeness feel more cordial, more relaxed? Could he believe that anything, in fact, had changed? Whatever the reason, now it was he who was wanting to talk about things he had never revealed before. He didn’t know how it would happen, but he knew when he did, it was Helen he wanted to tell. They checked into their casa rural, more upscale than their usual albergues. They not only had a private room, but a private bath also. They showered and washed their wet, muddy clothes. The routine of arriving and cleaning up had rejuvenated him. It was still early afternoon. Hungry, they found a rustic restaurant with stone walls, hand-hewed beams, apparent locally made sausages hanging over the bar and, and a roaring wood fire. They grabbed a table next to a window looking out over the distant mountains. Encouraged by her sharing earlier, over an overpriced bowl of caldo gallego, a rich stew of local vegetables and meat, and a glass of beer, as a tentative first step, Bert ventured a bit of sharing of his own. Bert felt good as they got up and paid their bill. Telling Helen his long and closely held secret was a vaguely emotional and surprisingly pleasant experience. He found himself thinking he might try it again sometime. She hadn’t reacted negatively, and even seemed to have enjoyed it. He had a bigger secret that weighed on him, and sometime she might learn about that one too. An opportunity came that very evening. They were drinking wine in the restaurant at their casa rural, finishing off the bottle that had come with their dinner. They were both relaxed and mellow. It seemed like he probably ought to grab the momentum. He hadn’t gotten over his reticence to talk to her about things he thought of as private, and talking about the photo had been difficult for him. But it hadn’t turned out badly. He wasn’t as embarrassed as he expected; he didn’t feel stupid. He was relieved that she had taken him seriously. Her insights about his relationship with the rules and expectations were a total surprise—probably right on the mark, he thought. She had opened the gates by sharing her concerns earlier. He thought of her as much less willing to share than he—and he was Fort Knox. But, then he had second thoughts. This was probably not the right time to talk about the second secret. It would be too much pushing their envelope all in one day. They had plenty of days left on the Camino. If it seemed like a good idea later on, he would reconsider. His big secret wasn’t damning, at least not in the usual literal sense. And it wasn’t the kind of thing most people would keep wholly to themselves. Nevertheless, it was a heavy burden on him. Why, he wondered, had it been like that it all these years? Like keeping that old negative, he wished he’d known the Cruz de Ferro tradition earlier. He would have tied them both to a stone and kissed them goodbye. Since the Cruz de Ferro he had spent a lot of time, in what he had come to think of as his walking mind, with thoughts that seldom rose to his consciousness and even less frequently were allowed to stay there. The core of an answer to the question he usually ignored so assertively had begun to come to him. But he wasn’t there yet. He now suspected that Helen may have had similar experiences of self-recognition. If he shared his secret with her, she might have an insight like she did about his relationship with rules. She might be able to help him to fill in the parts he was still missing. He liked her comment about feeling like she’d known him since he was a boy. But what if, this time, her comment wasn’t comforting? Of course, that was the real problem; and that was why he was hesitating. Where would it end? It was why he wasn’t too upset when she pulled away that weekend after their divorces. In truth, he hadn’t been any more ready than she to try again. Once you start sharing, each secret might be more painful than the last. He wasn’t quite ready to begin filling in all the missing parts of himself. On the other hand, maybe that’s what the Camino and that Cruz de Ferro message are all about. Bert ordered a second bottle of wine for them. The genie was getting out of the bottle. He decided this would be as good a time as any. He steeled himself. “Hello.” Through the room came Jacques and Hélène, a couple they had spoken with while having a café con leche at a bar along the trail a few days ago. “Hold that thought,” whispered Helen. Burley, gray-bearded Jacques, still in shorts despite the mountain cold, and pale, slight Hélène with her plastic-framed glasses—Helen’s almost namesake—came over to the table and joined Bert and Helen. Bert hid his frustration well, but Helen gave him a knowing smile. The four of them compared notes about the relative values of their respective dinners. The Canadians had dined across the street at another restaurant and were just returning to the casa rural. They quickly ascertained that they were planning to walk to different destinations—the Canadians were stronger walkers—and after expressions of regret, they bid their farewells. Helen’s interested eyes gave Bert the clear go ahead to resume his monologue at the point where they had been interrupted. He waited for what seemed a very long time, expecting a gasp. Or what? He didn’t know what to expect. “Well, Fish and Wildlife was willing to hire me, even at my tender age, and I felt the organization was doing good work, had a great need for good science, and could benefit from my super sharp scientific skills. Plus, it was a way to get a taste of the real world before I returned to academia. “As things turned out, and as you know, the Service did have a great need for good science, but I eventually learned it wasn’t the kind I had earlier excelled at. Fish and Wildlife Service science was no better or no worse than academic science, but it wasn’t the arena where a prodigy could make much of a difference. Helen seemed anxious to set the conversation on a better course. “Bert, I’m glad you told me. Odd, isn’t it, how things we have kept completely to ourselves are so painful to share. First of all, it’s horrible carrying around such a burden for so long. Then telling someone else about it, just saying it out loud, brings back the agony that made you keep it a secret. She appeared to be gathering her thoughts. She stared into a little lantern on the table, seeming to seek light from its flickering candle. The room was dark, and the candle’s reflection in her eyes gave them an emerald cast that he’d never noticed before. Was she scolding him? Of course not. Why wasn’t he feeling much of anything? Her way of seeing his decision to join Fish and Wildlife and his sense of having failed to achieve what he was supposed to, given his talents, was a new way of thinking about that time in his life. Maybe she had it right, but the conclusion was too different for him to go there yet. He needed to think about it more. He would do that, but not just yet. Something had stuck in his mind, however, and he couldn’t let it go. He didn’t know what to think. He didn’t feel like he was saving his life, but could it be that he might help Helen to save hers? The next morning as they had loaded up their gear and headed down the stone pavement, Bert was still ready to talk. “We’ve been giving each other career counseling for years in our informal, gossipy sort of way,” said Helen. He retraced the times in their careers when they had worked together in reasonable contentment. Then she had made the critical move that put her career on an upward and rewarding track while he remained behind and suffered a series of disappointments. His recommendations on protections needed for several endangered species had been cast aside in the face of what he regarded as political expediency. On a seeming tailspin, his career appeared bound for a crash. But it had been rescued by a temporary promotion to a position where he performed competently. The promotion became permanent, and he expected to continue in it or a similar post until retirement. It didn’t really make him happy, but it was better than before. His health intervened, however, and then came the task force. This was as close to being happy at work as he’d been since she’d left for the Florida job. Helen knew all of this, but she let him go on so she could get some sense of how it affected him. Could he ever be happy with his work? She cut him off. He looked shocked by the interruption, but waited for her to say what she wanted to. I had never guessed that Spain was such a mountainous country (it looks flat on all my maps), but the past several days have involved much scrambling up and down steep slopes. Coming down from the Cruz de Ferro we had a bad trail, a long steep climb down, and a dazzling blue sky. Yesterday we had the exact reverse. We climbed almost 2,000 feet in less than six miles, mostly in foggy drizzle. We won’t complain about the weather though because when we got to the top of the mountain it turned beautiful again. Once past the physical hardship, our only concerns have been the really basic need to get where we are going, manage to find some food and lodging, and as often as possible to enjoy the beauty around us. Last night, we were almost 3,600 feet above the cares of the complicated lands beneath us. With pastures teeming with cattle and sheep, we are literally surrounded by evidence of life’s bounty. Today we came back down those 2,000 feet, but had twelve miles to do it. A piece of cake! The one thing missing in this tiny town where we are staying tonight is an abundance of computers, and an anxious-looking young woman is waiting for me to get off this one. That’s fine with me, because I have told you all you really need to know about how our trip is going. One final thing: I have no bars on my Blackberry. If you need to get in touch with me, you’ll have to wait a day or two until we return to the twenty-first century. Oh, and of course I’ll have to remember to turn the contraption on. Santiago grew closer, and Helen and Bert were experiencing the first real rain in days. Despite the need to wear ponchos, Helen felt upbeat. Today’s rain was not like the hours of drizzly gloom enveloping them on the climb to O’Cebreiro. This warm, gentle rain felt friendly and nurturing. Now in Galicia, with its Ireland-like climate and look of the land, rain was more expected. This wet weather was inconvenient, but hardly threatened the disaster that the soaking rain had seemed as they walked their first few days through the Pyrenees. Today, rainy weather felt to her like just an inseparable and essential part of their Camino. She smiled as she remembered fleetingly having had a similar thought way back on Day Two in Zubiri. They were occasionally sharing the muddy road with farm animals. Bert took the lead when that happened. Helen was hesitant to compete for a travel lane with oncoming cows. He seemed confident, but Helen wasn’t certain that cows would seek to avoid head-on collisions with humans. She noted the lack of concern on the part of the farmers driving the cattle along, and this gave her added confidence that Bert wouldn’t be mowed down. Bert mentioned that all the many cattle they had seen in Spain so far were the same color, and he thought they might be Brown Swiss. The words were scarcely out of his mouth when they rounded a bend and came upon a pasture with black and white heifers. From that point on they passed other herds, some partially and some entirely populated by black and white cattle. Bert said something about the dogs and their apparent lack of motivation, and she agreed. The cattle seemed to be following the people, and the dogs following everybody else. What was the relationship here? With no cows in sight for the moment, she was walking a few steps ahead of Bert. She was surprised and delighted when through the mist she spotted a familiar person sitting on a low stone wall. Ilsa was trying improbably to write in her notebook held beneath her poncho, peering down through the neck opening to see the page. She looked up, her expression registering recognition when her eyes went from Helen to Bert. Her rain-streaked face broke into a broad smile. “Well, look who’s here,” she exclaimed, with evident delight. Helen rushed up to her. Somehow in the time it took Helen to cover a few meters, the notebook and pencil were stowed and it was poncho to poncho hugs all around. Having long since lost track of the days, Helen couldn’t remember how long it had been since they last saw Ilsa, but guessed it must have been the better part of a month. “How have you been? And how have we missed seeing you along the trail?” Helen thought they must have been walking close to Ilsa, and wondered why their paths had never managed to cross. “You can count me in,” said Bert, who other than a brief perfunctory hug, hadn’t so far been brought into the conversation. They continued down the trail, with Helen and Ilsa walking side by side like teenage friends, and Bert following close behind them. Helen briefly wondered why she liked Ilsa so much. Maybe it was the way Ilsa reached out to them with her story, without any expectation that they would reciprocate by opening up to her. “How has your Camino been going? Has it helped to improve your spirits?” Reluctant to pull Ilsa back to the painful revelations about her role in her daughters’ estrangement, Helen’s inquiry was as generic as she could make it. Surprised they were the only ones she’d told and curious about what they had said or done that had been so important to Ilsa, Helen was full of questions. She was almost ready to pose the first one when Bert spoke up. She might have spoken directly to one or the other of them, but looking anywhere other than straight ahead was nearly impossible while wearing a hooded poncho. So looking ahead, she spoke loudly enough that both of them could hear her. “Let me back up. When we had our conversation in that restaurant, I had never before told my story. The guilt was a heavy secret I had been carrying around. When I told you about it I believed my regrets and disappointment were the real burden, the sum of my problems. It seemed so simple and straightforward. But it’s funny how things worked out. She stopped walking, causing Helen and Bert to also stop. She faced them, making eye contact and pushing some strands of wet hair back off her face. “I came to realize,” she said, “that blaming myself for how my daughters turned out—the weight of my regrets—wasn’t going to go away. I could walk the Camino forever. I could make the rest of my life a pilgrimage. But I couldn’t change the past, and my regrets would still be there. My real problem, and the one the Camino has helped me to understand, is this. I allowed those feelings to take over my life and to shut the doors to all the good things that might come in. “I realized that I should let myself smell the flowers and enjoy friendship, risk disappointment and even open myself to the possibility of finding a man to share a part of life. I have met some interesting men on the Camino, including you Bert. Who knows, someday one might come along who I don’t want to leave behind. “What a remarkable insight,” said Helen. “I’m really happy for you and so happy we were able to play a part, even if we were unwitting helpers. And, by the way, I think if you decided Bert was a man you didn’t want to walk away from, I might have to give some real thought to that situation!” She looked at Bert, wondering if he would respond. The Bert she had known for years would let it pass, but the new occasionally sensitive Bert might not. Ha! She noted with pleasure that he clearly wasn’t going to let her statement go unanswered. The same question had crossed Helen’s mind, but she was, as usual, much more reluctant than Bert to challenge Ilsa to come up with an answer. His tendency to just ask a question directly had worked wonders with Ilsa before. But that directness of his seemed reckless to her sometimes. She wished he’d be more cautious. On second thought, perhaps Bert wasn’t so reckless. Maybe she just felt that way because she didn’t like to be asked personal questions. She kept the doors closed on her personal things. Maybe she had trapped herself on her own side of the door. They still stood by the trail, three poncho-clad people facing each other in a rough triangle in a light rain. The bright red, yellow, and green of their raingear might remind someone of a traffic light. But Helen didn’t notice this, or their awkward venue. Nor did she take note of the occasional hikers who passed them. Her companions seemed likewise unaware of it. The people passing gave no hint of recognizing the unlikely image the three presented. Ilsa looked pensive. She seemed not to be vexed by Bert’s question, but rather searching for the answer. She spoke slowly. She hesitated briefly. Her Australian accent was perceptible—soft on the edges, but almost alarmingly harsh on the vowels. “They’re” and “hear” were spoken as if the word “air” were entrained in them. “That was then, but now that I think I know myself better. I think my inner eye may have seen in the two of you something that never made it into my conscious mind. Maybe my subconscious guessed. I hesitate because perhaps you don’t see it in yourselves. Still, I’m happy to have the chance to say this out loud because you helped me so much. Helen looked at Bert and thought she saw the same complete surprise in his eyes that she knew must be in hers. He didn’t respond and neither did she. Ilsa seemed happy to have shared her observation and to have no need for them to say anything. Helen wondered if her falling silent was a way of giving them time to deal with it. They had begun walking again. Deep in her thoughts, Helen was perplexed and troubled by the vibrations she had apparently given off to Ilsa. She wasn’t inclined to reject Ilsa’s words out of hand, but so much of what she’d said didn’t seem to fit. She wasn’t in any kind of cage. She thought of her successes. If she had ever been in one, she had broken out of it years ago. After all, her Camino was a celebration of all the good things the breakout had made possible in her life. The word “unknowingly” needed to be considered, however, and she began wondering if there were varieties of happiness she might have denied herself by the choices she made. His effort at bringing back the levity into their joyous reunion seemed to work. They had a happy coffee break and walked together all the way into Samos, where Bert and Helen would be stopping for the night. No deep conversations ensued, no mention of past burdens or future challenge. Helen wished Ilsa a heartfelt goodbye when they parted. Neither she nor Bert ever reacted directly to what she had said about them. Still, she couldn’t stop thinking about it. Helen didn’t want to believe that she was living in a cage she had made for herself. Perhaps Bert was, but certainly not her. But what of the coincidence that just moments before Ilsa had said that, in her own mind she had questioned whether she was too diligent in shutting people out and had even used the metaphor of closing a door? She needed to work on that. Whether Ilsa was right or wrong, she was grateful she had come into their lives. They had changed Ilsa, and she thought that in some way Ilsa might have changed them. As they had neared Samos in the early afternoon, the rain had slacked off. The three of them had stopped on a bluff at an informal mirador and gotten a good overview of the town and its famous Benedictine monastery. 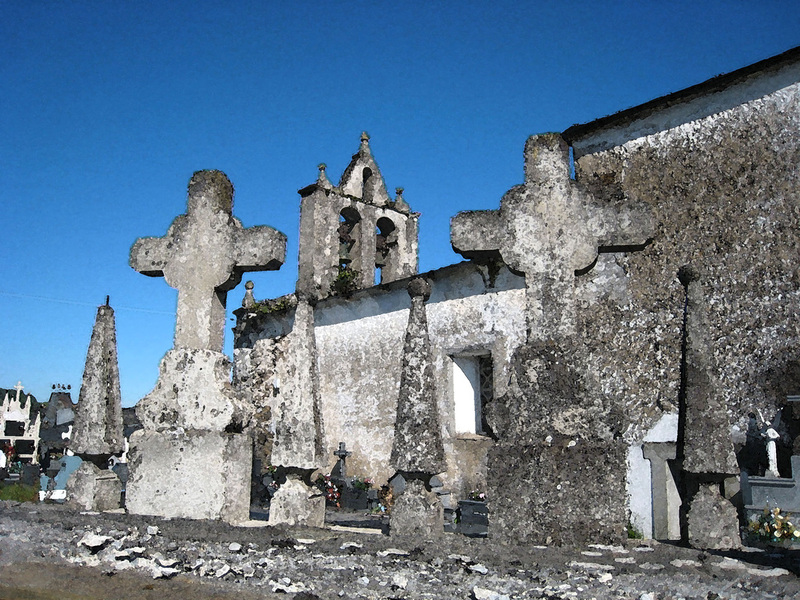 Part of the monastery was operated as an albergue, but Helen had been warned that it was basic, bleak, and likely to be crowded. Instead she and Bert had reserved a room at the Hostal Rural A Viega. After they said goodbye to Ilsa, found their room, and dropped off their gear, they set out to explore the town. Their exploration was disappointing. For some reason they were unable to understand, tours of the monastery weren’t being offered that day. They shared a small pizza in a little eatery where the ambiance was provided by an electronic pinball machine. After finishing their meal and wandering a bit, they sat on a park bench on the shore of the placid Rio Oribio, enjoying the tranquility that had eluded them earlier. Neither spoke, the almost inaudible murmur coming from the river providing all the background music Helen needed. A young couple walked by, pushing a baby stroller. Bert and Helen had seen them on the trail the day before, and also in the restaurant. She’d noticed the woman walking into the kitchen with a baby bottle. 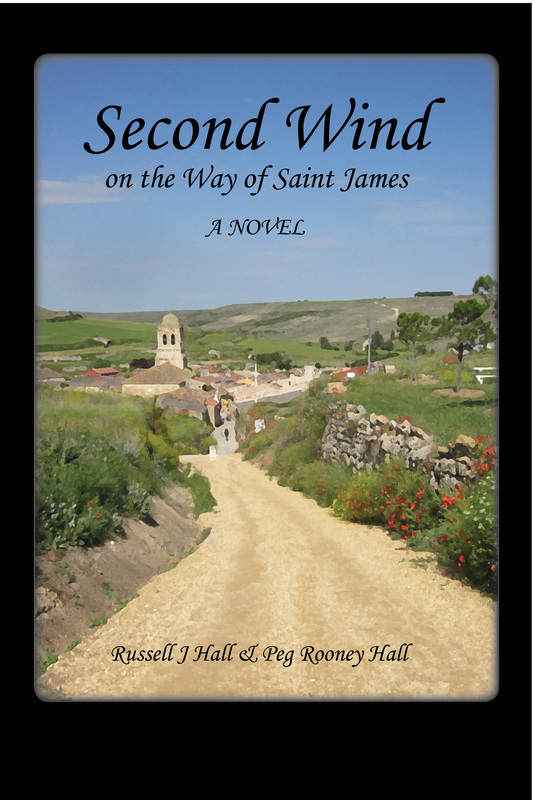 She had marveled that somehow they were able to take on the Camino with a child too young to walk. Suddenly she became aware that tears were filling her eyes—overflowing in fact. They ran down her cheeks and landed on her lap when she gave a little shudder. She hoped Bert wouldn’t notice. “Oh, it’s nothing. I don’t know. Maybe it’s pollen.” Maybe it actually was pollen, she thought, because otherwise why couldn’t she stop? “Oh, I hope it’s nothing I did,” said Bert, looking helpless. She had to reassure him that it wasn’t his fault. He put his arm around her shoulder. She thought of the pilgrims at the Cruz de Ferro. She was amazed that she did not want to pull away. “I don’t know.” She knew he was trying to help her, and right now she felt that he wasn’t succeeding. How could he know that the call from Donald wasn’t her only problem? She was only beginning to see it herself. Episode 7 will be available Friday, July 12. The Final Episode will be available Tuesday, July 16.